In 1973 three people namely Brian Holden, Gordon Ratnage and Melvyn Cameron saw the need for a Country Western Club in the Bletchley area. The trio started tentatively by holding their first meetings at "The Compass Club" eventually moving on to a more permanent basis at the "Gladiator Club" which was then the home of Bletchley Football Club. The first band a seven piece cost the trio £25. The promise from that day forward was that MK Divided C&W Club would present LIVE Country Music every Sunday fortnight to meet the demand. 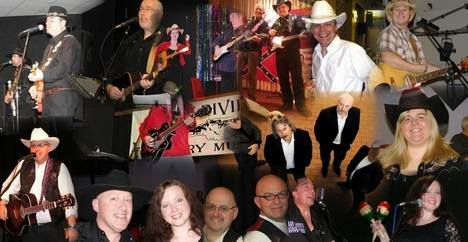 A fortnightly presentation of the best in UK country to date and this year MK Divided are celebrating Forty Six years (April 2019) of serving the area with a two weekly dose of LIVE country music. In the past MK Divided have hosted such bands as " The Hillsiders" "Kentucky County" and "The Alabama Hayriders" to name but a few of the bygone top artists, but the continue to bring the tops in UK country entertainment to the Club..
John and Trish They have been members since 1996. They have made the Club one of the friendliest in the UK. They took over in 2008, opening the doors to all ages, dancers and listeners - all are welcome. John's love of country music and wanting to keep it alive in Milton Keynes/Bletchley has taken the club from strength to strength. Sophie their daughter - now 20 - has also been an active member all her life, having grown up with the sounds of Country Music. 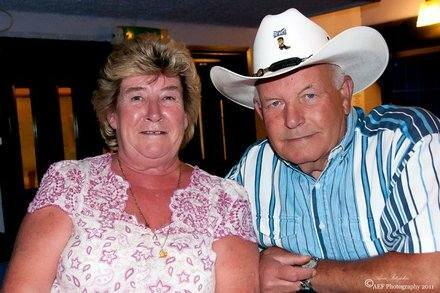 Ken & Sandra Ken first went to the club in approx 1979 when in Manor Fields. 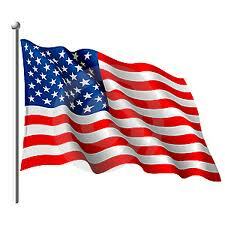 Ken likes the country music as it has a meaning, memories of the club …. the trips to various clubs and the days out to the American Air Force Base at Chicksands, which were arranged by Sid Shadbolt (a former committee member). Also coach trips to the Wembley Festival each April then - after moving to the Railway Club - The Wild Bunch used to have shoot-outs at the end of each session - until a member of the club got hit by a bullet from a misfiring gun, then the shoot outs were no longer. Then in 1995 I (Sandra) started going to the club with a friend and Ken and I met each other. All I can say is that Ken has rarely missed a club night, since the early days. We met John and Trish at Roger Sheperd's and Jim Thatcher's line dance classes, where friendships were forged. Then Brian Holden, one of the three founding fathers of the club, passed the rains to John Case as Chairman, and he has helped bring the club forward. Come along and sample the special atmosphere - a cheaper bar than usual - great company and what must be super value in entertainment! Some of the best Country and Line-dance performers in the UK play at our club every fortnight - you’re sure to have a great night out. 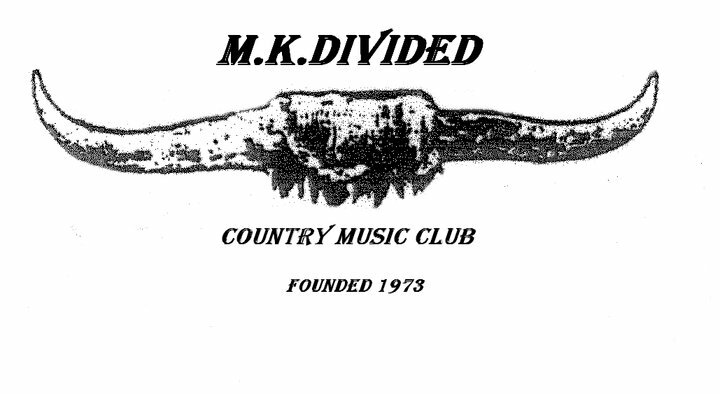 MK Divided celebrates 46 years of bringing Country Music to Bletchley - Should you need further information then feel free to call: contact John on 07789 953485 or via Facebook mkdividedcountrymusciclub. "KEEP IT LIVE - KEEP IT COUNTRY"
1 Chandos Place, Bletchley, Milton Keynes MK2 2SQ.